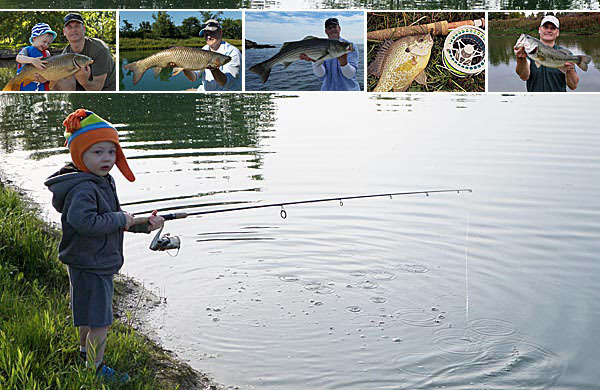 An annual review, along with setting goals for the new year, is commonplace for most anglers. For anglers who blog like myself, it makes it into a formal post like this but even the most casual anglers usually say things like “I sure hope this year I catch a” or “this year I’d like to do”. It’s always fun to look back and re-visit exciting accomplishments and/or catches, while also reflecting on unmet goals. Fortunately, this is fishing related, so I don’t have to confront the annual new Year’s Resolutions of getting to the gym more or eating healthier! Those annual mid January / early February fails cause more guilt than simply evaluating fishing performance, I think. Plenty of nice fish and a little guy who insisted on using the “big boy” rod! This past year was fantastically memorable for me and my family. We welcomed a daughter at the end of March while also managing a move. Anyone who has experienced the birth of a child and moving knows there aren’t that many bigger life events. This made it one of those years that if no fishing goals or accomplishments would have happened it would have been understood if not totally expected. Surprisingly, between setting realistic goals last year and a bit of good circumstances, I didn’t do that bad. I fulfilled the goal of watching my son catch his first fish and it was exactly how I envisioned it (post can be viewed here). I made a destination type trip and caught a lifer Striped Bass (view here). I explored new water as it became a necessity with moving. I did do a fair number of trips only taking my fly fishing gear. Under the circumstances, I did a good job in getting out fishing in general. The only goal I really didn’t do too well with was fishing with friends more. With so much going on, I rarely had enough notice to make plans with anyone.